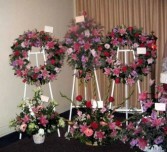 Funeral Flowers from HARKINS THE FLORIST - your local New Orleans, LA. Graceful and flowing with ivy and curly willow, this garden flower wreath is bright and elegant. 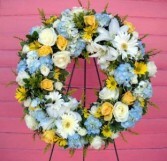 This is a lovely wreath in the soothing color combination of blue and white. 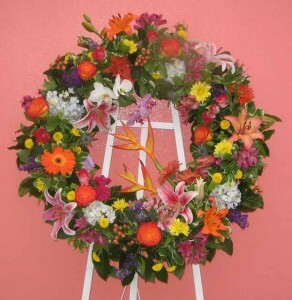 This large, lush wreath is filled with our best quality blooms, including lilies, gerbera daisies, bright roses, tiny spray roses, hydrangea, lisianthus, and more. We can style this lovely tribute in the colors of your choice. This lovely wreath is accented by clusters of golden roses and yellow gerbera daisies. This makes a thoughtful tribute, symbolizing a circle of love. The spirit of a never ending circle of family or friendship is captured in this wonderful wreath. Among the lilies and gerbera daisies are woven delicate blooms of alstroemeria and roses. 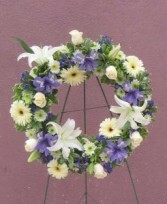 We styled this wreath for a cremation service. An urn will nestle in the center to be surrounded by a beautiful assortment of colorful garden flowers. 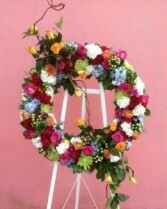 An elegant wreath of mixed bright blossoms makes a wonderful floral tribute. 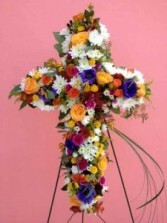 This is a lovely floral tribute for a memorial service, or any service. 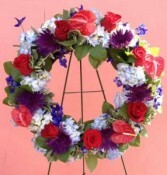 The large size of the wreath opening allows for the insertion of a portrait of your loved one. Truly a memorable piece. 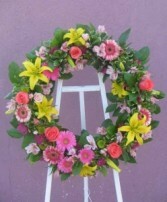 This wreath may be styled in any color combination you may choose. These wreaths and easel spray were part of an ensemble of coordinating family pieces. Should you care to have an ensemble such as this, one of our designers would be more than happy to help create just the setting you are looking for. 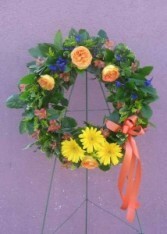 A wonderful wreath to celebrate a wonderful life. 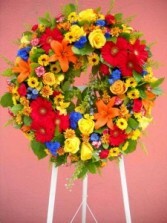 This bright, vibrant wreath uses the primary colors of red, yellow and blue. We've included roses, gerber daisies, delphinium, lilies, daisies, poms, and solidago. 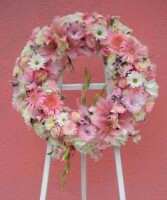 This pastel wreath is beautifully feminine. 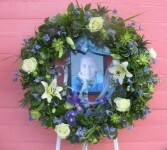 We've completely covered the wreath with flowers, no foliage was used. 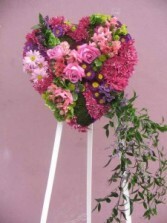 The flowers include hydrangea, lilies, gladiola blossoms, roses, gerbera daisies, daisy poms and mini carnations. So beautiful, so sweet. This is a large wreath, on a 24 inch frame. Using minimal foliage, we've covered this wreath with a wonderful mixture of garden flowers, which includes, green hydrangea, orange lilies, roses, daisies, lisianthus blossoms, mini carnations. Just stunning. A delicate, pastel wreath. Such a special way to convey your condolences. This may be created in many different color combinations. One of our designers will be happy to help you choose just the right one. 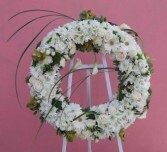 A serene white and green color commbination is classic with this full floral wreath. 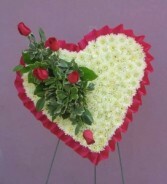 The flower types include daisies, roses, hydrangea, dianthus, cymbidium orchids and poms. A very striking display. A lovely tribute. This large, 24in. 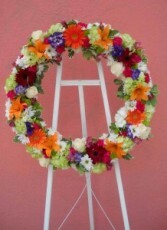 diameter wreath is just filled with garden flowers of all colors. 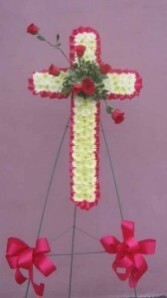 Roses, mums, hypericum, hydrangea, kiwi vine and more roses, all displayed on a white wooden easel. This lovely piece is our bleeding heart. 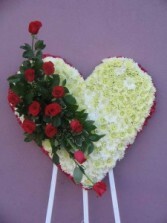 The heart features 5 red roses representing the drops of blood. The roses spring from a bed of lemon leaves and varigated pittosporum which adds nice texture and color, these are all designed upon a ground of white chrysanthemums. A hand pleated satin ribbon adorns the outer edge of the heart.